Christmas in Taos is definitely a multicultural event. Not only are the Christian and Jewish holidays of Christmas and Hanukkah celebrated, but there are also the Native American, Hispanic, and Winter Solstice traditions that make this time of year so special. 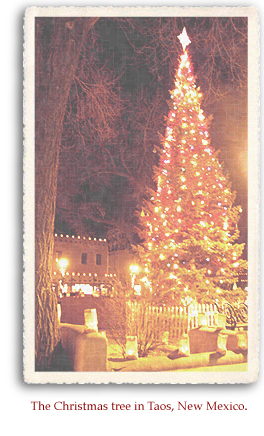 As in other areas of the USA, the season begins just after Thanksgiving, with the lighting of the towns Christmas tree on Taos Plaza. Locals gather to sing carols as they await the arrival of Santa Claus, who makes his entrance upon an old fire truck. 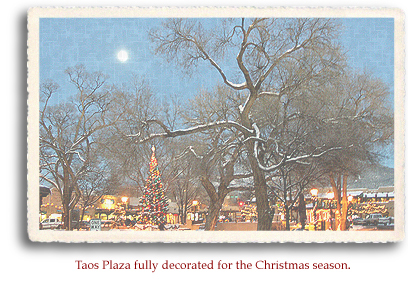 An annual Taos event, this highly anticipated evening ushers in the holiday season. The museums, galleries, studios, and merchants of Ledoux Street open their doors to the public, offering music, refreshments and warming bonfires along the winding road brightly lit with faralitos. 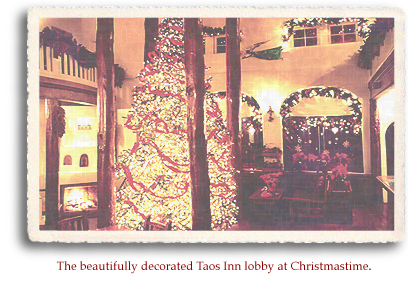 This night offers a true taste of the Christmas in Taos experience for locals and visitors alike. Sixty Christmas trees decorated by local businesses and groups are sold at auction to raise money for area non-profit organizations. The Taos Chamber Music Group brings musical masterpieces of the era to Taos Community Auditorium. Hanukkah, the Jewish Festival of Lights, is observed for eight nights, starting on the 25th day of Kislev (according to the Hebrew calendar) and may occur from late November to late December on the Gregorian calendar. The Taos Jewish Center has several celebrations during this time. For the nine days preceding Christmas, the old Hispanic tradition of Las Posadas takes place. It is a candlelight procession at Ranchos de Taos Plaza, in which Joseph and Marys journey and search for shelter is reenacted. The Spanish morality play, Los Pastores, is also a local tradition. It commemorates the visit of the angels to announce the birth of Jesus to shepherds keeping their flocks outside Bethlehem on Christmas Eve. The version of this play, as performed in Taos, is said to be the one closest to the original play written in the 1500s. Sangre de Cristo Liturgies puts on these performances on or around Christmas Eve. 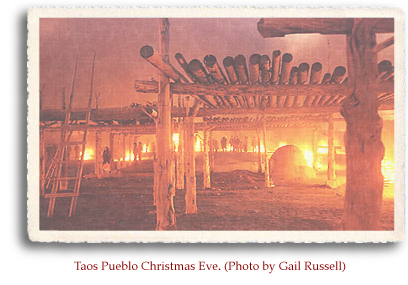 Taos Pueblo honors the birth of Christ with a vespers service held at dusk on Christmas Eve. Following the mass at San Geronimo Church, Pueblo men lead the way through those gathered on the Pueblos plaza, as the churchs statue of Mary is carried through the plaza before it is returned to the church. The men shoot rifles into the air to salute the birth of Jesus. Bonfires of pitch wood are lighted to warm those who gather for well-wishes all around. On Christmas Day, Taos Pueblo celebrates with the performance of Matachines (animal) Dances, which are also performed on New Years Day. In the Ranchos de Taos, Llano Quemado and Talpa areas, Los Comanches is performed by descendants of hispanicized Comanches, in honor of Emanuel, the newborn Christ child. Of course, many visitors come to Taos to enjoy the ski season and to participate in other winter sports. Others come to reunite with family and friends. 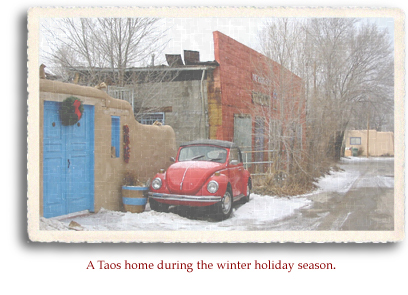 But whatever the reason, a trip to Taos at Christmastime is a unique experience...one that will never be forgotten.